Jordan Crane is a comic creator whose work I’ve been hearing about from my more indie comic-oriented friends for YEARS, but The Clouds Above is the first of his works I actually sat down to read. Last week while my daughter played on the library computers I did my usual perusal of the kids’ graphic novels and there it was. I wasn’t sure if it was actually appropriate for younger readers (our library system doesn’t seem to really understand what most of these books are), but I knew that I wanted to read it. 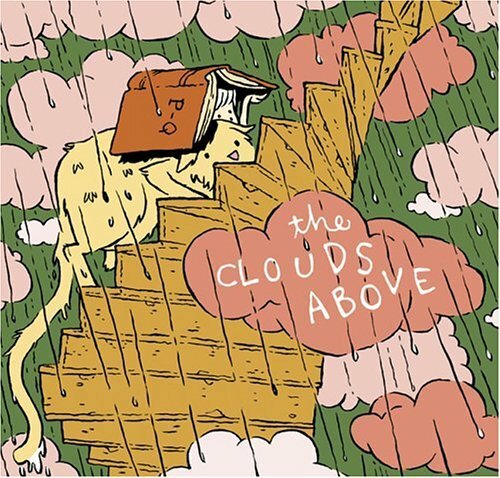 I’m happy to say that, The Clouds Above (published by Fantagraphics in 2005) is a great story that can be enjoyed by readers of all (or rather most) ages. The 224 page, 6×6-inch book follows the adventures of a boy named Simon and his talking cat Jack as they discover a secret staircase to the clouds on top of Simon’s school. While ascending, they talk to birds, teach a sentient cloud to fly, fight storm clouds and eventually find their way back to school. I appreciate that Crane keeps the material light and kid-friendly without shying away too much from emotional scenes. There’s a part of the story where their cloud friend turns himself into rain, but saves Simon and Jack so they don’t smash into the ground. There’s a sad beat there, but then the cloud says he’s happier than he’s every been now that the birds are enjoying the puddles he has become. I thought this was a particularly beautiful scene that probably has a teaching moment buried inside that I’ll figure out upon further reflection. As far as red flags go, there is talk of death (“We’re gonna die!”) and a teacher beating Simon with a phone book, but not much is made of it and she’s ultimately made to look a fool which is important because she’s one of the few violent characters in the book. 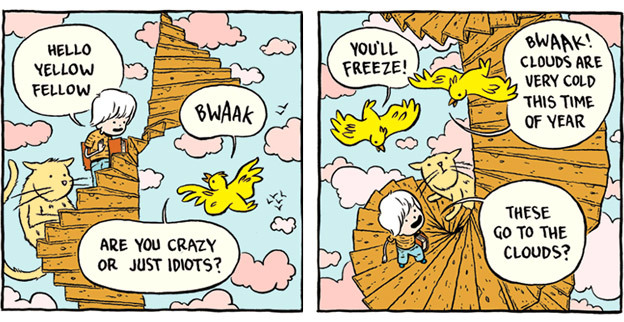 The others are birds, but birds are always jerks, so that stands to reason. Essentially, if your kids like Adventure Time, I think they’ll enjoy this book as both feature a boy and his talking, yellow animal friend going on a somewhat surreal adventure. The Clouds Above not only works well as an all-ages story, but also offers a nice bridge for younger readers transitioning from storybooks to comics. 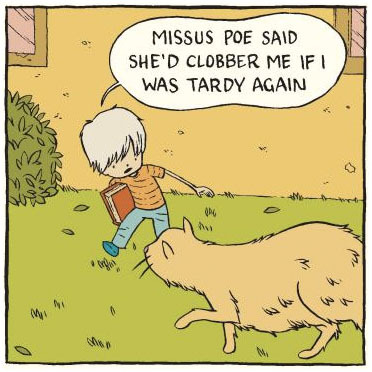 Thanks to picture books, kids are used to this idea of information being doled out in one-page bites so Crane’s one-panel-per-page style here makes sense for them . I’ve noticed when reading comics with several panels per page to my daughter that it can be a little hard for her to keep up, so I try to point to each panel. Crane eliminates that problem altogether while also keeping a nice pace to the story. I haven’t been able to get our 3-year-old to actually sit down and read The Clouds Above just yet — it’s like harnessing a tornado most days — but I did sit with our 11-month-old the other day and read it to him. He actually sat through most of it which is pretty huge considering his usual attention span is roughly 11 seconds! Like I said, I got mine at the library, but you can buy a copy as well through the Amazon link above. You can also download the first 20 pages of this graphic novel from publisher Fantagraphics to see if it’s your bag.